Oh man, have I got the most delicious side dish for you today. This salad lovingly combines two of my favorite things: grains & greens. 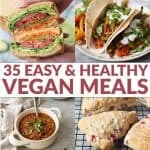 As a mostly plant-based eater, these two items are always front and center of my plate. A nourishing balance of fiber, energy, vitamins/minerals and antioxidants. Have you tried ancient grains before? While all grains are essentially ‘ancient’, these grains are ones that are largely unchanged over the last several hundred years. 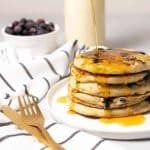 Modern wheat, which has been constantly bred and changed wouldn’t be considered one, but sorghum, teff, millet, quinoa, amaranth, buckwheat and wild rice are. Whole grains are specifically produced to retain all parts of the grain. Often grains are refined to remove the nutritious bran and germ, which are packed with fiber, vitamins and minerals. That’s why we often talk about using whole grains vs. refined grains. You’re getting all the good, healthy parts of the grain when you choose the whole grain option. I know that quinoa has gone from lesser-known-grain to everyone-is-eating-it status over the last few years, and I promise that the other varieties are just as delicious. We love sorghum anywhere we’d use rice, millet in grain bowls, amaranth instead of oatmeal and wild rice in everything from soups to salads. Introducing these “new” ancient grains with unfamiliar flavors or textures doesn’t have to be difficult. If you’re looking to switch up your usual-suspect grains, try adding in one of these to your diet. 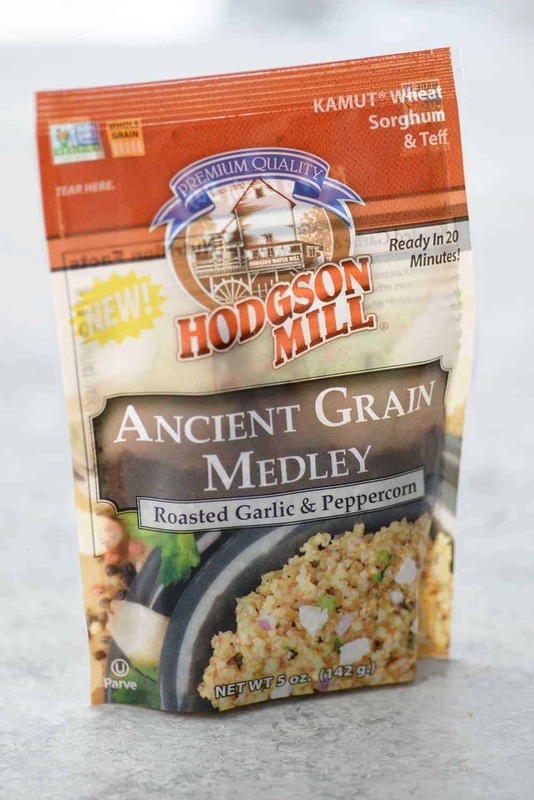 Thankfully, Hodgson Mill makes it easy with their new whole grain side dishes. With grains and seasonings all in one pouch, you can enjoy these ancient grains in just 15-20 minutes with little fuss. 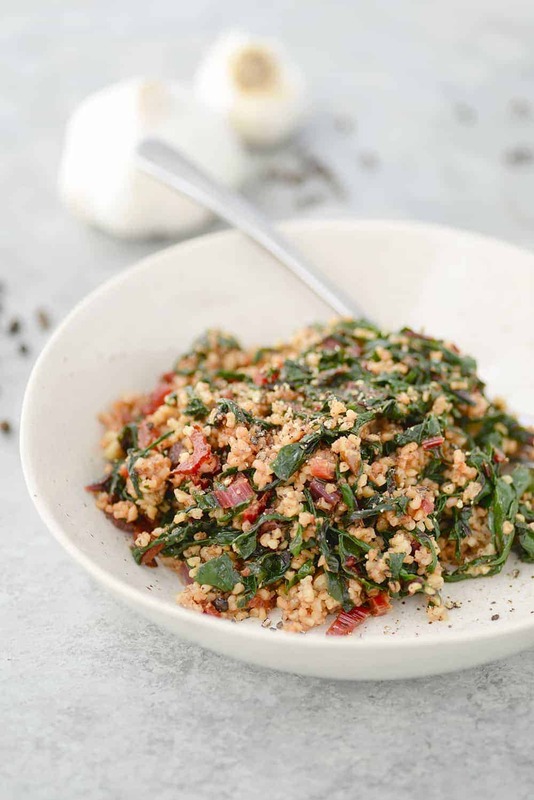 This recipe features kamut, sorghum and teff in the yummy roasted garlic peppercorn flavor. While these pouches are delicious on their own, I wanted to add in some garlicky greens for extra flavor and color. Honestly, I almost need to make two batches of greens when I prepare it this way. I usually pick so much at the finished dish right from the stove, that there’s hardly anything left by the time I go to serve them. Thinly sliced swiss chard leaves in olive oil and garlic might be one of life’s most simplest pleasures. Cook the packet of grains according to package directions. While that’s cooking, saute the swiss chard stems and leaves in a little garlic and red pepper. Combine the two, add some walnuts for crunch and that’s IT. A simple, healthy side dish that’s a perfect way to add in more ancient grains. I hope you enjoy this one as much as I did. Not a fan of swiss chard? No problem. Any leafy green, like spinach, chard or beet greens would work the same way. The Hodgson Mill side dishes are new, and can be found in-store in select areas, but can also be purchased online at www.hodgsonmill.com or Amazon. 1 bunch rainbow swiss chard, stems thinly sliced and leaves thinly sliced into strips. Prepare the swiss chard. For easiest prep, remove the tough ends of the stems and discard. Thinly slice the remaining stems and set aside. Then, stack the leaves and roll tightly, like you are rolling a burrito. Then, starting at one end, thinly slice into ribbons. Keep the stems and leaves separate. Prepare the Ancient Grain Medley packet according to package directions. 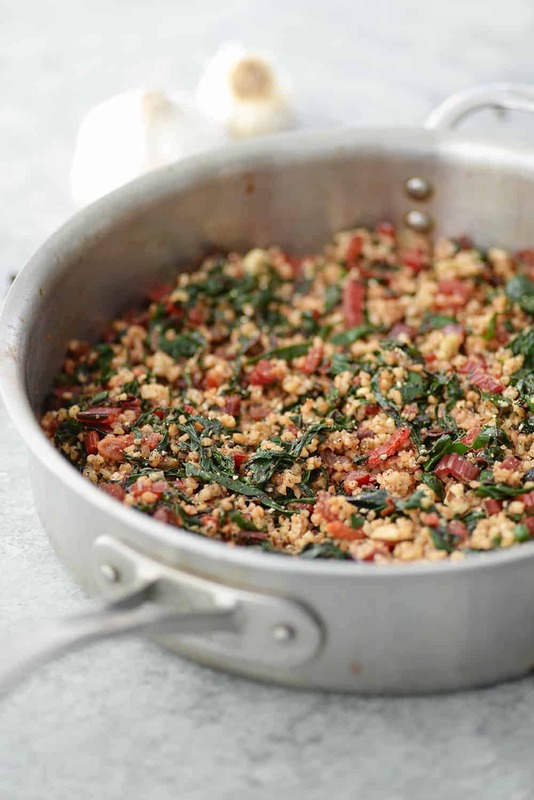 While the ancient grains are cooking, heat the olive oil in a large saucepan over medium heat. Add the garlic, red pepper flakes and salt and cook until garlic is just softened, taking care not to burn, about 1 minute. Add the swiss chard stems and cook until soft, about 5 minutes. Add in the leaves and cook an additional 5 minutes until leaves are just wilted. Stir in the walnuts and remove from heat. Season to taste, adding more salt/pepper, if desired. 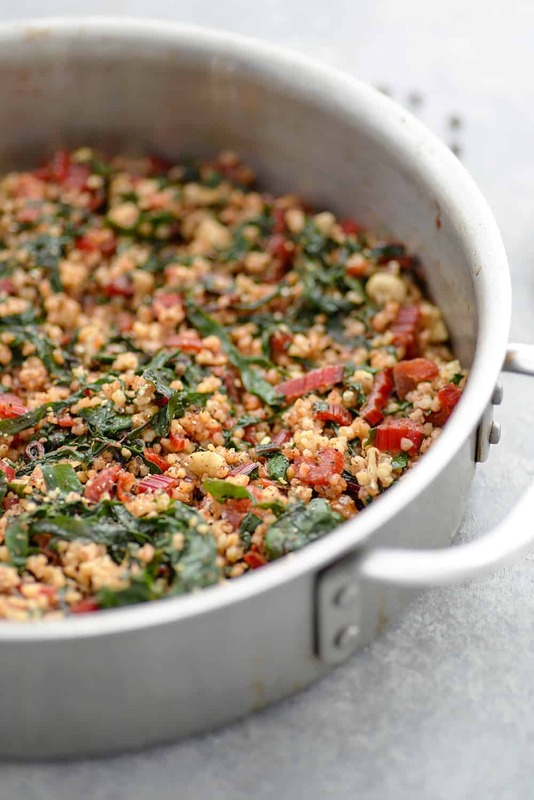 Add in the contents of the ancient grain medley to the swiss chard pan and stir to combine. Serve immediately.